I am a nineteen year old girl living in London, and started this blog as a way of channelling my interests, as well as a way to develop my writing skills. I have enjoyed writing since I was a young child, and currently would quite like to pursue a career in journalism or some sort of communications based industry, so this is an exciting opportunity for me to do something I love. In terms of my interests and favourite things, I enjoy reading, fashion, beauty, spending time with friends and family, baking, Christmas and chocolate. Hopefully you'll get to know a lot more about me as you read more of my blog. For now, all I have to say is that I hope you enjoy! 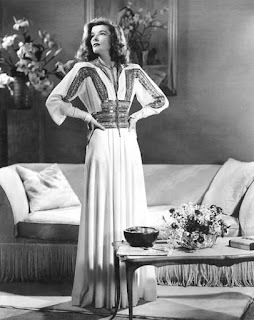 I remember the first time I glimpsed Katharine Hepburn's style. It was in an illustrated book of classic film costumes that I was given as a child, in which she was depicted in the white and gold embellished evening dress she wears in the 1940 film The Philadelphia Story. However it wasn't until fairly recently that I recognised her as the true style icon she was. Hepburn was something of a fashion revolutionary, famously insisting on wearing trousers to be on equal footing with her male counterparts, when actresses at the time were often highly sexualised. In 1951, when told in Claridge's Hotel that women were not permitted to wear trousers in the lobby, Hepburn simply chose to use the staff entrance instead, refusing to adhere to the patriarchal diktat of the 20th century. Apologies for the length of time since my last blog post- unfortunately the majority of my time over the last couple of months has been taken up with revision, exams and prom preparations. However that is all over now and I finally have the whole summer ahead of me to spend time with friends and family, blog, relax, and generally enjoy the sunny weather, before the dreaded results day in late August. Last week I was lucky enough to spend the first week of my holidays in the Isle of Wight with my parents, staying in the beautiful Bembridge. Growing up, our trips to the Isle of Wight were an integral part of my childhood, and I have so many happy memories of making sandcastles, visiting Blackgang Chine and taking the chairlift at the Needles. It was therefore a great experience to revisit this wonderful part of the UK as an eighteen year old, to see all of the sights that I remember so well.